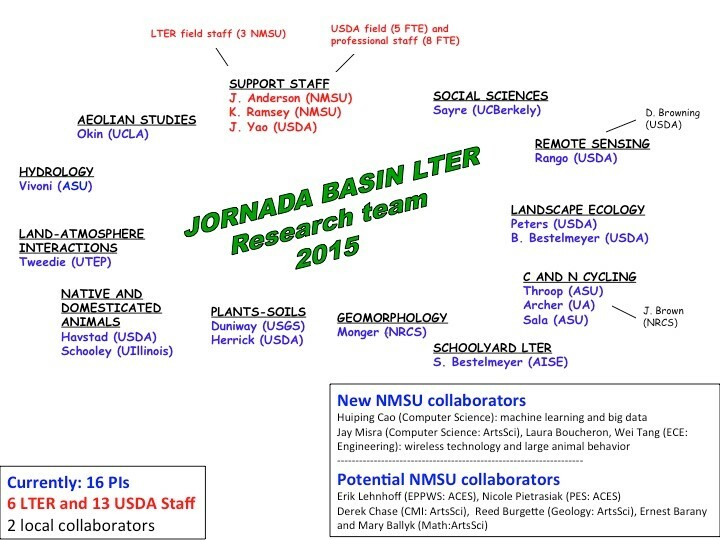 Our Jornada LTER research team includes 16 investigators, 19 staff, and 2 local collaborators. Our organizational structure includes 1 lead PI, 15 co-investigators, a 6-member Executive Committee (JRN-EC), 6 fulltime NMSU and 13 USDA staff, and a large number of temporary employees (NMSU undergraduates) (above figure). Our co-investigators are strategically selected through time for their expertise, experience, interest in working collaboratively, and dedication to long-term research and data accessibility (e.g., all PIs have ≥1 core long-term dataset online). As a result, our group includes faculty from nationally distributed universities (Arizona State Univ. [ASU], Univ. Arizona [UA], Univ. Illinois [UI], Univ. Texas at El Paso [UTEP], Univ. California at Los Angeles [UCLA], Univ. of California at Berkeley [UCB]) as well as scientists from two federal agencies (USDA, USGS). Each investigator has a clear role in the overall project, and participates in specific studies depending on her/his interest and the expertise needed for a question. Interactions among investigators occur informally when needed, and formally at our annual PI meeting held in conjunction with our annual Jornada symposium. Resources available to investigators include technician support, supplies, site-based travel, and salary for site-level infrastructure. Formal assessments of progress are made at least every other year. Reallocation of funds is based on: productivity (i.e., quantity/quality of journal papers); leveraging of outside funding; collaboration with team members; graduate student involvement; submission of datasets to our information management system; cross-site and network-level involvement. Collaborative, dynamic approach. Our philosophy is based on collaboration such that research teams are dynamic and form as needed for specific questions rather then being static through time. This collaborative structure is an important mechanism for stimulating discussion of research plans and results, charting progress, and collectively identifying emerging topics and trends. The majority of resources not allocated to site-based infrastructure are provided to teams in the form of shared M.S. graduate students at NMSU. We successfully used this approach in LTER-V with a focus on PhD students. In LTER-VI, we will prioritize M.S. students because they are better suited to the studies proposed here, and to maximize the number of students and investigators directly involved in JRN-funded projects. Prioritizing NMSU students will optimize resources by reducing overhead and out-of-state travel costs, and will allow greater opportunities for minority students from this Hispanic-serving institution to participate. We will continue to provide partial support for Ph.D. students funded by other sources, such as teaching assistantships and other awards. Selection of projects for LTER student funding will be determined through a competitive process. Teams will submit a justification, rationale, and expected products, as well as outcomes from previous student funding, for each request to the JRN-EC for evaluation and prioritization. Communication. Since early in LTER II, Jornada researchers from multiple institutions have had to devise ways to communicate effectively. Our annual Jornada Symposium, initiated in 1990, remains one of our most important venues for communication. Although attendees include many other scientists and students (>150 for the past several years), a 1-2 day co-investigator meeting occurs the same week. We also use teleconferencing for discussions involving local and non-local investigators. Leadership continuity and administration. We continue our pattern of evolutionary change in project leadership and scientific personnel that began in 1982. Debra Peters continues as lead PI, a role she took over in 2003 following the departure of Laura Huenneke to the University of Northern Arizona. Walt Whitford (PI during LTER I), Bill Schlesinger (PI during LTER II-III), and Laura Huenneke (PI during the first half of LTER IV) continue their involvement in our scientific program. Peters as lead PI provides overall project leadership. She is the principal contact for NSF, the LTER Network Office, NMSU, and collaborating scientists. She has overall responsibility for coordinating sampling activities, data management, site promotion, and baseline analyses. She also prepares annual report and supplemental proposals, and attends the annual LTER Science Council meetings. Peters along with K. Havstad (USDA), C. Monger (NMSU), O. Sala (ASU), G. Okin (UCLA), and E. Vivoni (ASU) comprise the JRN-EC with ultimate authority in decisions of allocating resources and setting policies. Our commitment to education is reflected by the inclusion of S. Bestelmeyer, the coordinator of our Schoolyard LTER program and director of our partner, the non-profit Asombro Institute for Science Education (AISE), as a coPI on our proposal cover page. Our site manager, John Anderson, makes decisions about the use of lab, office, and field facilities by visiting and local researchers, and consults with the JRN-EC as needed. Instead of an external Advisory Committee with limited number and diversity of members, we have developed ca. two-dozen specific cooperative research agreements with a cross-section of clients and stakeholders to provide more effective two-way communication and collaboration. Havstad, Herrick, and B. Bestelmeyer (USDA), and Duniway (USGS) serve as liaisons with local, regional, national, and international agencies and institutions. Succession planning. We plan for unexpected changes in leadership through a level of redundancy: the JRN supports travel for at least one additional co-PI to attend each Science Council meeting, we promote active involvement by co-PIs in each LTER All Scientists meeting and network-level workshops, and the JRN-EC is involved in all major JRN program-level decisions. Long-term change in leadership takes time to train a lead PI in all aspects of the program. The Jornada USDA is expected to fill several open positions within the next 3-5 years, and we will use these positions as opportunities to recruit and train a future lead PI. We do not expect appropriate faculty openings at NMSU in the same time period. Recruitment and diversity. Given resource limitations of LTER, we are very strategic in recruitment of new members to our research team. Our approach to fill major gaps in knowledge and expertise is through active recruitment of investigators as the need arises, and to seek diversity in gender, expertise, and ethnicity. We will continue this approach that has been very successful in both building our research group and dealing with turnover. For example, of the 12 JRN investigators in 1997, only two are current members (Monger, Havstad). In 1997, only 3 investigators were local (NMSU, USDA) whereas our team now includes 5 USDA scientists. In LTER-V (2006-2012), we added two senior scientists with international expertise in aridlands (a grassland ecosystems ecologist, Osvaldo Sala [ASU], and a shrub ecophysiologist, Steve Archer [UA]). We also added an aridland hydrologist (Enrique Vivoni [ASU]), a soil scientist (Mike Duniway [USGS]), and an expert in UAVs (Al Rango [USDA]). In LTER-VI, we added three co-investigators, each with different expertise to increase both our ecological depth and breadth: Nathan Sayre (social scientist, UCB), Robert Schooley (animal ecologist, UI), and Craig Tweedie (cyberinfrastructure and wireless technology, UTEP). Our investigators include two Hispanics, and 3 females and 13 males. We will continue to attract and retain minority students, particularly Latino students, through NMSU, UTEP, UA, and ASU as Hispanic-serving institutions. Integration of non-LTER scientists. We actively integrate non-LTER scientists into our program through collaborative projects, some are co-funded by the JRN and others are supported by other sources. We have a large number of collaborators in state and federal agencies as well as other countries, as indicated by co-authors in our publications. Our key local collaborators are Dawn Browning (phenology) with the USDA and Joel Brown with the NRCS. Integration of non-LTER technical staff. The USDA provides access to 5 full time technical staff based at the field site to provide routine support, housing, field offices, and emergency assistance to collaborators and students at no cost. Within Wooton Hall, the USDA provides access to an additional 8 full time technical and professional staff to provide GIS, data management, field research, data analyses, and office support to PIs, collaborators, and students at no cost to the LTER. LTER-USDA site collaboration. The USDA continues to provide support in terms of salaries for federal scientists and support staff, and field support (e.g., on-site security, on-site facilities, vehicles, on-site assistance). Office and laboratory facilities are located in the USDA Wooton building on the NMSU campus without cost to NMSU or LTER. Field sites are located on the USDA-Jornada Experimental Range and the adjacent NMSU-Chihuahuan Desert Rangeland Research Center (CDRRC). These properties located within 30 km of NMSU represent >100,000 ha dedicated to long-term and experimental research. Researchers have access to field-oriented laboratory facilities at the USDA headquarters on-site with reliable network access and a water storage system as well as trailers for overnight stays. NMSU and USDA provide cell phones available for check out by researchers and students to enable emergency contact with campus and emergency personnel when in the field. A collaborative effort with the USDA is adding wireless connectivity to sensors, such as rain gauges and flumes, as funding permits. (1) New faculty hires - NMSU is committed to hiring one new faculty in 2016 to replace Monger in ACES, and Peters has been asked to serve on the search committee for this position. The LTER is in discussions with Arts&Sci and the Biology Dept. about replacing Throop with an ecologist to work with the Jornada. These discussions are on-going. (2) Center of Excellence – the Biology Dept has been the administrative “home” for the Jornada LTER for historical reasons. Laura Huenneke was the original lead PI when the grant returned to NMSU, and Laura was in the Biology Department. However, support for the LTER has waned since Laura left for NAU in 2003, and the program now lacks visibility and tangible support at NMSU. Over the past 6 years, the LTER has been a bi-college endeavor with the overhead distributed between the College of Arts&Sci and ACES. More recently, we are actively increasing our collaborations across the university to include the College of Engineering (Fig. 1). We believe that the Jornada LTER is the epitome of a Center of Excellence at NMSU, and as such should be elevated to a central office to improve collaborations among colleges and to promote visibility within and outside the university. To accomplish this, we recently requested that the administrative home of the LTER be moved to the Vice President for Research’s Office. The physical offices and the overhead distribution of the LTER would not be affected by this move. Discussions are underway with the Provost, Vice President for Research, and Colleges of Arts&Sci and ACES about this move, and we are optimistic that this change will occur in time for the distribution of FY2016 funds. (3) Collaborators – Recently, we increased the NMSU collaborators involved in the LTER in the College of Arts&Sci (Huipang Cao has a graduate student working with Deb Peters and Geovany Ramirez on the KLAS machine learning project to improve data accessibility) and through the wireless technology team in the College of Engineering (Laura Boucheron, Wei Tang) and Arts&Sci (Jay Misra) who are working with Kris Havstad on developing sensors for detecting large animal feeding and predator-avoidance behavior across complex landscapes. We are optimistic about the potential for other collaborations to develop in time (Fig. 1). Most of the administrative and infrastructure services and support needed for the operation of the LTER program is provided by the LTER through its administrative assistant working with the USDA: the LTER offices and laboratory are housed in the USDA’s Wooton building where the USDA makes direct utility payments to NMSU with no charge to the LTER or NMSU, and 80% of the LTER research is conducted within the USDA property where field staff and infrastructure support are provided at no charge to NMSU. The total expenditure by the USDA is estimated at ca. $300,000/y in direct support of the Jornada LTER. The overhead generated by the LTER and provided to NMSU is not utilized by the USDA in any fashion in support of the LTER program or to offset these support costs, nor does the USDA seek any compensation. The LTER program is highly valued by the USDA for the scientific capacities and collaborations it provides to both the USDA and to the larger scientific community.